A few months ago, the editor of the Middlebury College Alumni Magazine, knowing that I authored this blog as an avid trail runner, asked if I could write a short column on the pleasures of trail running. Never one to shirk on my responsibilities as a member of the faculty (unless, of course, I just don’t’ feel like doing it), I suggested that I write a slightly longer article, involving a run near the campus, in the style of my blog, and he agreed that this would be good. 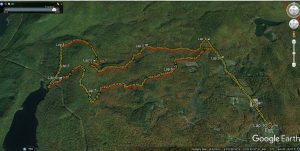 So….I took a previous Middlebury Trailrunner posting, and modified in so that it featured more of the campus features. One of the great pleasures of a career in higher education, is observing, and laughing at (and with) the quirks of this particularly curious career, which I love, especially since I have always felt sincerely honored to have had this career opportunity at a school like Middlebury College, in a town as special as Middlebury Vermont. 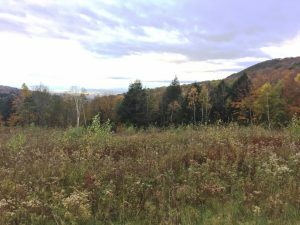 So, in typical Middlebury Trailrunner style, I poked fun at things I saw along the way, especially those which alums might find amusing, and maybe even part of their experience. My friends in other corners of the college are probably used to the demands of their editors. Scientific writing, (and blog authoring as well) is as a rule, very lightly edited, if at all. As a result, I don’t know of any of my previous career publications being changed in any way between peer review modifications, and publication. When my article appeared in the recent issue of our alumni magazine, I was a little bit surprised to see that a lot of my fun asides, poking fun of the college in what I thought was a good-natured way had been edited out of the article. That said, the presentation in the final article is beautiful, and I can live with the editor’s judgement as to the audience for this article. But, I thought it would be fun to include a link to the published article, and then show the article that I originally submitted, and let my readers decide which version is more fun. The well-presented, but alas, homogenized version of my short article can be found in the recent issue of the Alumni Magazine. My original version of the article is as follows. I think it is more fun! As a member of the Middlebury College faculty, I would like to welcome you to campus. Most Middlebury students know of me as a chemistry professor; in fact, a fair number of you will be taking General Chemistry from me this year Fortunately, professors are allowed to have other interests, and one of my preferred avocations is distance running, and am particularly fond of running long distances on our local trails, in the village of Middlebury, as well as the nearby mountains. 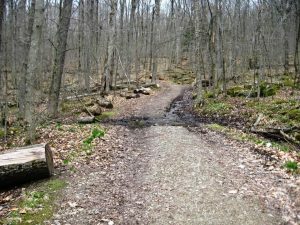 I have been sharing my trail adventures on a blog called “The Middlebury Trailrunner” for 9 years, and the subject of many of my postings has been the beloved “TAM”, the Trail Around Middlebury, an 18-mile loop which can be run in small segments, or in its entirety for the more ambitious. I thought I would welcome you to campus by sharing a short section at the periphery of the campus. Think if this as Trailrunning 101! This run starts out the back door of the athletic complex – yup – that great place where you can work out on all the cool exercise contraptions your tuition dollars can buy (or our generous alums can buy for you – and a sincere THANKS). My advice is to save the ellipticals and treadmills for the cold of deep winter, and enjoy the out of doors for now. Head out the back door, and run just to the right of the high tech artificial turf Kohn Field, to the left of the Squash Center, and veer into the woods on the left – there are usually a few soccer goals stashed here, so the trail entry should be easy to find. When I started teaching at Middlebury 32 years ago, this was just a big empty field. How on earth did I find my way to the trail? The first, and tamest part of this TAM segment is on the trail which runs around the outskirts of our very own golf course. The golf course trail is pretty easy, with no major impediments to its many runners and walkers. 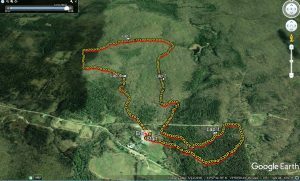 In fact, it is the course used by our national-caliber cross country running team at their home races, and was lit for nighttime cross-country skiing in the 1980s. After about a mile, you pass the first noteworthy sight on this run. 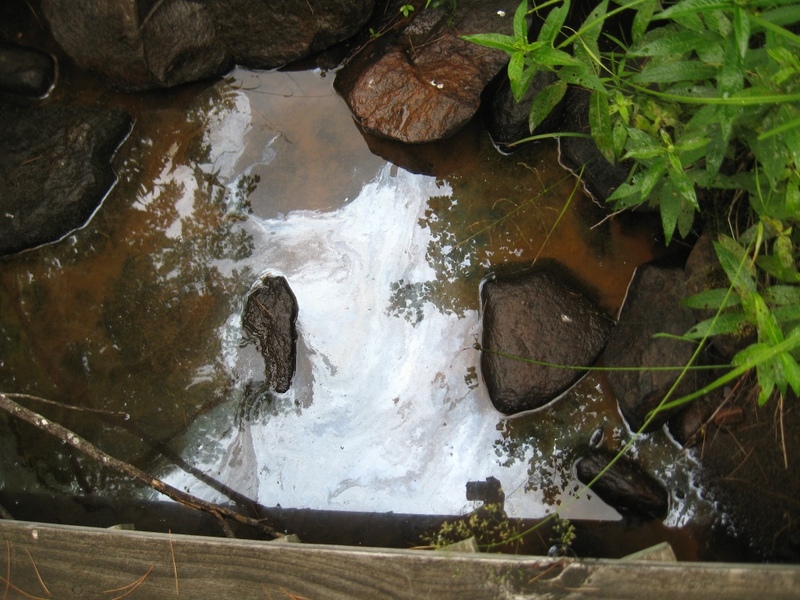 You can’t help but notice it, as it smells…like rotting food scraps…which is what it is. At the most odiferous point on the run, off to your left stands the mountain of compost, largely the result of your leftover Procter food. No wonder our dining hall staff is always reminding you not to waste food, going so far as to eliminate dining trays so you can’t load up too easily! Not long after this, a short, steep climb rises above you, and as you near the top, you will notice a lone gravestone off to your right, near the 11th tee. A hint for those of you taking Gen Chem from me; I love to add fun Middlebury trivia questions at the end of my tests for extra credit, and every few years, I ask if anyone knows what the person interred there died from, a fact which is indicated on the gravestone. In a rather macabre turn of events, the poor gentleman commemorated there, William Douglas, survived both the French and Indian War and Revolutionary War, only to die when a tree fell on him soon after he returned to Middlebury. I am sure that the trees were really big back then as well! Continue across the ridgeline onto the new section of trail which enables runners to stay pretty well out of the range of some of the errant tee shots from golfers setting out on the back nine, before emerging into the open, passing by a large white house on your left called Hadley House, rumored to be the scene of some wild trustee parties. 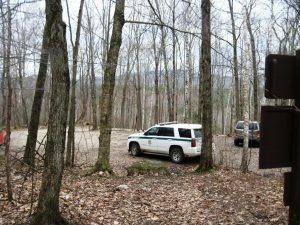 This is also a great place to enjoy spectacular views of Vermont’s Green Mountains, to the east. This view will never get old. Trust me. On your right, you will also see Youngman Field, the football stadium, taking a moment to be impressed by the massive panther statue on a rock behind the stadium. Apparently some of our most generous alums went panther statue crazy 15-20 years ago, and now the campus is adorned with the outcomes of their generosity. The stadium panther is rather dramatic, but another sculpture of a panther eviscerating a deer was strategically hidden in the gardens of the President’s house. A short run along the old golf course entrance road brings you to Route 30, where you need to cross to continue the run. If you are out of gas at this point, it is a short downhill trot to the athletic facilities for a nice two mile run. However, if you cross the road, there is some more challenging trail running to be found. At the far side of Rt. 30 you will find the entrance to the segment of the TAM known as the “Class of 97 Trail”, honoring a deceased member of that class. The narrow, rooty, and usually muddy descent from the ridgeline will challenge you to watch your footwork, but two summers ago, there was an additional hazard; a large, and overprotective mama owl was attacking passing runners, in my case drawing blood! Such are the pleasures of true trail running. After less than a mile in the woods, the trail emerges into an open field, where a left turn will lead to a long loop through the farm fields which make up some of the great views to the west of the campus. If you were running this section, a little more than a year ago, you would have noticed that the field was occupied by a cluster of small, prefab homes, known as “the mods.” They were installed almost 20 years ago, to serve as temporary housing, but we have a tendency to get attached to our temporary buildings. I am telling you this, so that when you come back for your 10th, or perhaps 25th reunion, and notice that the “temporary” home of the Computer Science Department, currently under construction behind Allen, is still there, you won’t be surprised. The trail winds along the periphery of the farm fields, heading west, until it crosses College St. and follows a short dirt road to the serene quiet of the college organic garden, one of my favorite places on campus. By now, if you are starting to feel a little tired, you are in the home stretch! Take the dirt road back through the fields towards campus, enjoying the views of “Hadley/Lang/Milliken/Ross/Laforce”, dorms which were known as “The New Dorms” for about 30 years (and used to be covered with what sure looked like oversized bathroom tiles, rather than the current, far more attractive stonework), and the hulking shape of Bicentennial Hall, which was christened “The Death Star” by students at its opening 19 years ago. The solar panels also seen here are a relatively new addition to the fields, and on sunny days, they look quite lovely, reflecting the blue sky. Near the Bicentennial Hall driveway, cross back over College Street, and catch the sidewalk which climbs back up onto the main campus, through the wooded environs of the Ridgeline Woods dorms, originally built to allow our social houses to move away from the village to a location where their natural boisterousness would not rouse the wrath of nearby residents. Follow this sidewalk to the top of the hill, and cut through the graveyard before finishing the run back at the athletic center. The last cool sight to point out, if you have the time to look, is the gravestone of an Egyptian mummy buried in the otherwise Christian cemetery. Henry Sheldon, the original proprietor of the downtown Sheldon Museum, purchased the mummy of a very young Egyptian prince, but realized that it was not in good enough condition to put on display, and instead had it buried, with a very curious gravestone, after many years in storage. Crossing over Rt. 30 one last time – you come face to face with the original front entrance to the athletic complex, which you can only enter through if you sprout wings, due to their current configuration. 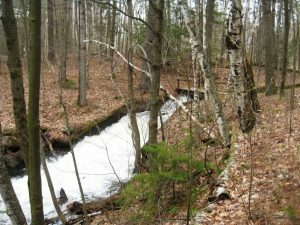 This run, about 5 miles long, and mixing great scenery with Middlebury college history and trivia is a great way to first experience the pleasures of trail running. Feel free to check out my blog if you want to explore the local mountains and forest more extensively, and I hope you enjoy the next four years here! 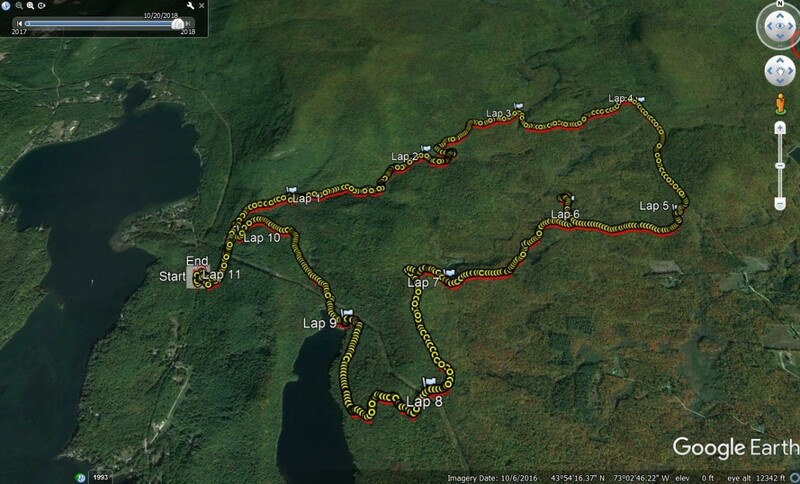 It seems like all of my posts this season have been describing runs in the Moosalamoo/Silver Lake region, and this posting will be no exception. On a cool, overcast Saturday morning, I joined up with a few running friends for another one of my favorite runs – the ascent up the North Branch Trail, beginning from the Falls of Lana parking lot, just south of Branbury State Park. So the three of us, accompanied by my friend’s labradoodle, Tizzy the Wonderdog, began our ascent on the service road. Just past the Falls of Lana, where the service road to Silver Lake makes a sharp switchback to the right, stay straight, taking the left turn over bridge, followed by a sharp right over the next few yards. This puts you on a trail, which if you remained on it, would bring you up to the Falls of Lana. At one point, you will have to vault over a fallen tree trunk, with a curious infinity sign painted on it, indicating that this segment of trail is also part of the course for Andy Weinberg’s legendary 888 km “Infinitus” event. But since we were feeling like mere mortals, we knew that this would be our only loop past this today, and after a few minutes, we came to the grassy clearing, where the actual North Branch trail veers off to the right. Shortly after turning onto the trail we saw a few other runners and friends coming our way – they had apparently gotten a head start on us, and were already descending from the summit of Mt Moosalamoo. Nine years ago, when I started writing this blog, it was a rarity when I saw another runner on the trail, and now it is far more common, a testament to the increasing popularity of trail running in this part of Vermont, and the US as a whole. Over the next half mile or so, the climbing gets to be a little steep, requiring a few short sections with more hiking than running, and in no time at all, the stream that we crossed at the start of the trail was a few hundred feet below us. The trail in this section is well maintained, but narrow and rocky, and the brilliantly colored wet leaves on the ground covered some of the natural hazards make for slow going in sections, but as the leaves were thinning on the trees, at one point I noticed a substantial waterfall peeking out from behind the trunks, noting that I had only seen this before when it was early spring or late fall – the summer foliage always seems to obscure it! One can remain on the North Branch trail all the way to the Moosalamoo Campground, but on this run, I decided to take the short exit trail to bring us up to the little known Voter Brook overlook, at the end of the campground road, hoping to catch the fall scenery from this quiet little viewpoint. The combination of the cloudy weather, and the past peak foliage dimmed the splendor of the place, but only a little bit! From here we decided to stay on the road back to the Moosalamoo Campground, and eventually the Ripton-Goshen road. Looking down at the road, which is very lightly used, it looked more like it was unused, as it was covered thickly with fresh leaves, and a few small washouts indicated why the last few hundred yards were not used. But still, the road, which was actually very pleasant running, was still covered by undisturbed leaves. In not long, we came to what seemed to be the cause of the road’s disuse – a fallen tree which would block traffic. This was still a little puzzling, as the Forest Service usually does a good job of taking care of fallen trees, even on little used roads, but after hopping over this modest impediment, I could see that the road was still unused. Eventually, we reached the sharp descent and turn in the road, where it normally passes over a small stream with a culvert under the road, and we finally saw what the real problem was – apparently, at some point in the year or so since I last passed this way, the road had washed out entirely, leaving a little bigger project to reopen car travel to the overlook. It apparently has been washed out for a while, as the local beavers had already created a dam across the culvert. From here we continued on the now gravel and dirt road, sans leaves, until we reached the Ripton-Goshen road, where we took a right, and after a somewhat surprisingly tough climb to the high point of the run, took the snowmobile trail to the right, where you see the forest service gate. This begins a long gradual ascent, a nice respite after all the climbing to get up here. The main snowmobile trail is usually easy to pick out, but some recent small scale lumbering activity had made a previously “minor” trail look more substantial, so we got off course for a short while until we realized that this side trail was getting faint. 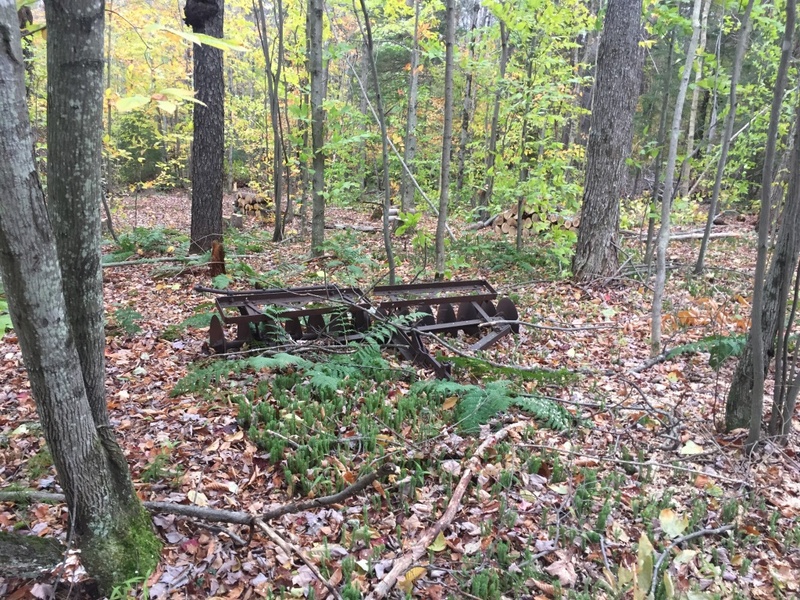 It was interesting to see a rusted out old plow in the middle of what appeared to be probably a 50 year old forest – it has clearly been a long time since this land was cleared for a farm! Finding our way back to the main trail, it eventually bottomed out over a well-built snowmobile bridge, before a short steep climb up to the Silver Lake forest service road, well above the lake. Going straight here would have been the shortest way back to our cars, but instead we took the left turn, leading to an undulating climb up to the Goshen Silver Lake trailhead, which was nearly empty. Getting back on true single track, we followed the descent to the Leicester Hollow trail, and followed it back to the “beach”, which not surprisingly, was empty, although we did see some people kayaking out on the always quiet lake. Finishing the run with the last mile and a half descent to the parking lot, passing quite a few hikers out for what will probably be their last hike of the season, brought the run to its conclusion. This ended up being a 10.5 mile run, with a solid 1500 foot climb and descent, although a lot of it was more undulating than grinding. 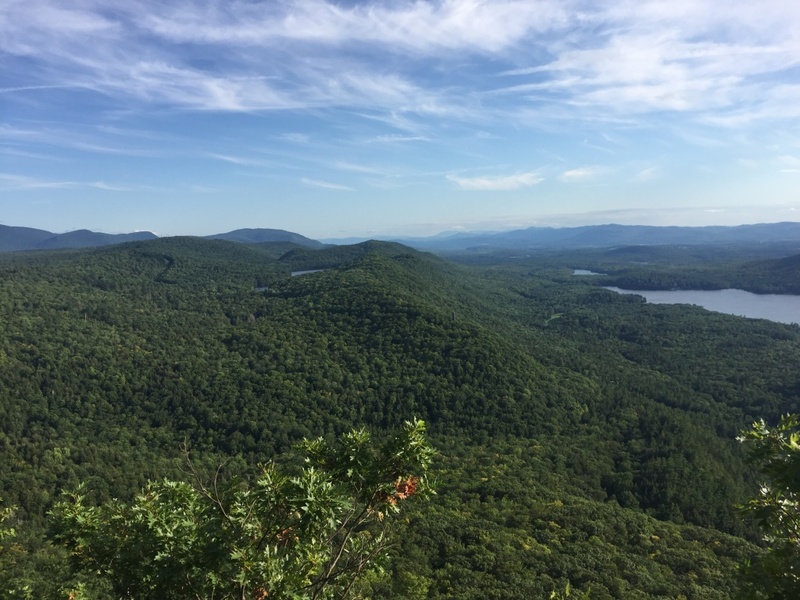 One of the most popular “hikes to a view” in Addison County, is the hike up to the Rattlesnake Cliffs on the lower slopes of Mt Moosalamoo, where there are spectacular views of Lake Dunmore to the east, Silver Lake to the north, and the main ridge of the Green Mountains to the west. Over the last decade or so, this viewpoint has become a little bit more challenging to access, as the return of nesting peregrine falcons has necessitated closure of this popular viewpoint from early spring to the beginning of August, limiting this lovely overlook to late summer and fall (except for the hardy winter hikers and skiers) so that the falcons can have their babies in peace. 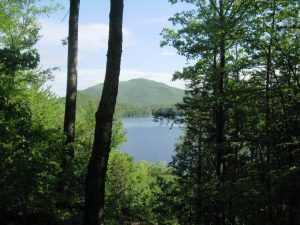 Hiking up to the Rattlesnake Cliffs from the popular Falls of Lana/Silver Lake trailhead, just south of Branbury State Park leads to two possible ascending trails. The longer, but gentler Rattlesnake Cliff Trail, described in an earlier blog, and the more direct, steeper Aunt Jennie Trail. 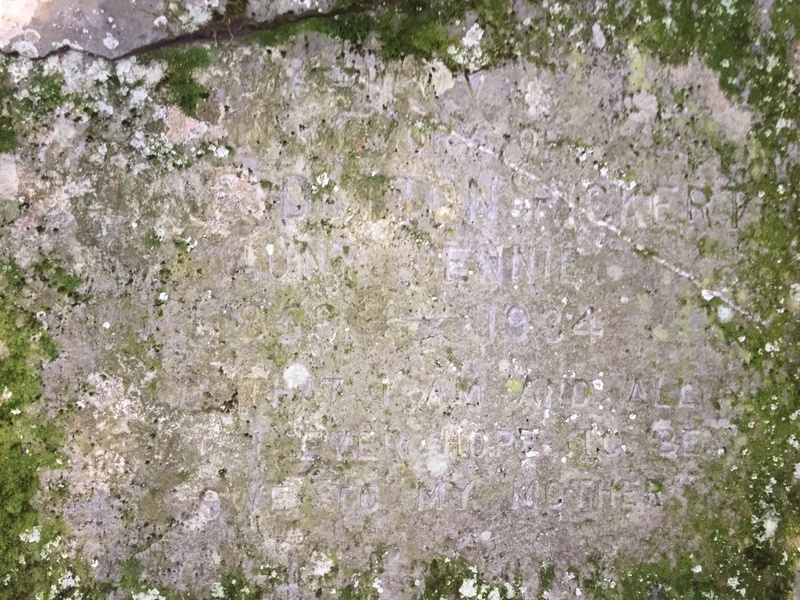 Based on a few conversations with old-timers in the area, I became interested in who the eponymous Aunt Jennie was, and what her connection to the trail or area was. And I am not an old-timer yet – not quite. A little bit of easy googling came up with the answer – Aunt Jennie was a woman who ran a popular eatery on flat lot, formerly the site of the old Falls of Lana trailhead, a quarter mile closer to the falls than the current location. A short writeup mentioning Aunt Jennie, as well as her teahouse (the picture of the teahouse provided by Bill Powers, a local historian) can be found on the Lake Dunmore Association blog, from a few years ago. The run up to the Aunt Jennie Trail begins much like many of my other runs in the region, from aforementioned Falls of Lana trailhead. After the first short climb, the trail up to Silver Lake takes a sharp hairpin turn to the right, but to head up to the Rattlesnake Cliffs, one goes straight, taking a turn to the left over a footbridge put in place after the 2008 flooding which took out an older bridge. After crossing the Sucker Brook, turn right, and after a short run, the well-labeled Aunt Jennie trailhead appears to the left. I hadn’t hiked up this trail in many years, but as expected, it was significantly steeper than the longer Rattlesnake Cliffs trail. While the longer trail is gradual enough to be good uphill running over much of its length, I would have to say that, at least at my current climbing ability, less than a quarter of the Aunt Jennie trail is actually runnable, so most of this rapid ascent is more a power hike, with a few faster footsteps when it levels off in a few places. After about ¾ of a mile, the Aunt Jennie Trail ends, and a left turn, joining the Rattlesnake Cliff Trail will take one to the left turn, well signed, leading to the Rattlesnake Cliffs for the great views. Heading towards the cliffs, I noticed something was different. In the past, there were two separate cutoffs to cliff overlooks. The first cutoff led to the prominent ledges on the East face, and somewhat to the north. When I found myself on the south facing cliffs, I wondered how I missed the first turnoff. Further exploration, led to another short trail that I didn’t think had been there in the past, leading to the great views of Lake Dunmore to the east. At this overlook, I was treated to a dozen or so huge birds sailing around me, often very close, and landing on nearby ledges. Were these peregrine falcons? Were these some other proud raptor, like red tail hawks? 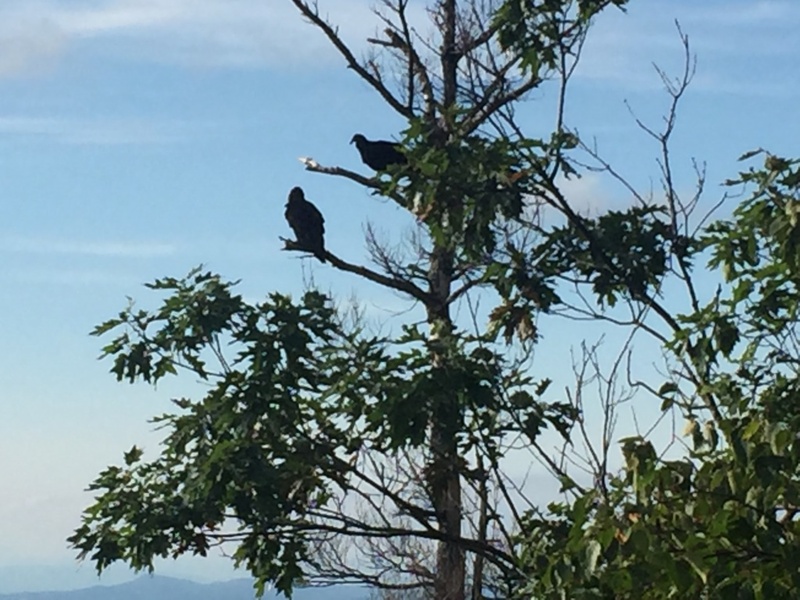 Nope – they were plain old turkey vultures, but watching them, I developed an appreciation for some birds that would be considered lovely, if not for their tiny heads, and carrion-eating habits. Who knew we had so much food for them here? If they are attracted by the scent of rotting carcasses, what does that say about the scent of a very sweaty trail runner? Looking down at the lake, getting increasingly empty as the summer season winds down, I saw a lone speedboat, tugging a lucky waterskier, leaving patterns in the water that reminded me of old Spirograph artistry. On my return, I stopped for a few moments at the overlook, facing to the south, including Silver Lake, Lake Dunmore, and in the distance, Fern Lake. Is it my imagination or colorblindness, or are the first little bits of orange starting to creep into the foliage? Looking more carefully on my return, I did manage to see the trail to the “old” Lake Dunmore overlook. 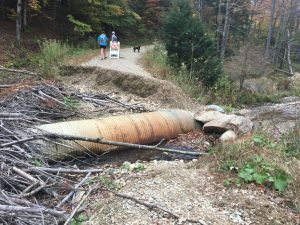 It no longer had any signage, and it looked as if trail maintenance crews had tried to obscure its presence. My suspicion is that this overlook is being discouraged to keep hikers away from the main falcon-roosting area, but I don’t know the full story here – anyone with something to add to this, please feel free to post your comments! A little bit of further research shows that this is nearly identical to a quote made by Abraham Lincoln about his own mother! A short trot back to my car made this run/climb a little bit more than 5 miles long, with a challenging 1500 ft of climb and descent! 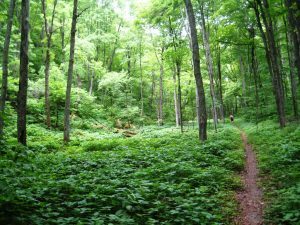 One of the great recent additions to the local trail running season has been the advent of the Moosalamoo Ultra, an early August race, now in its 8th year, which starts and finishes at the Blueberry Hill Center in Goshen. The Blueberry Hill Inn, which has sponsored the Goshen Gallop a “mere” 10K trail race for many years (40 years as of tomorrow to be exact!) has also opened up its trails and resources for two other trail races of even greater challenge and reward – the aforementioned Moosalamoo Ultra, and the even hairier Infinitus. The Moosalamoo Ultra actually comes in two flavors, the “Big Moose”, a 36 mile race, which I was barely able to finish six years ago, and still very challenging 14 mile “Little Moose”. These races are the inspiration of local ultra runner John Izzo, who, with a small cadre of volunteers, and apparently every member of his extended family, hosts, and manages the Meese. One of the events John likes to organize every year is a “Big Moose Preview”, where he invites locals to come run a fun segment of the race, so that they know what they are in for on race day. My travels preclude participation in this year’s race, but I enjoy the terrain and the people, so I joined in. 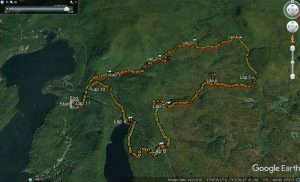 The segment of the race we were running last Saturday corresponded to approximately miles 15-25 of the Big Moose course, so runners competing in the Little Moose wouldn’t be seeing any of their actual race. We had a modest-sized crew of runners for this warm-up run, aged 14-69, and an equally diverse range of speeds, but all of us shared the love of running trails in the mountains, and an eagerness to complete challenging athletic endeavors. Setting off on the Goshen-Ripton Road, heading north towards Ripton for about a mile and half, we took the first “major” trail splitting off on the left, a section of gradually descending snowmobile trail, which made for generally easy trail running. 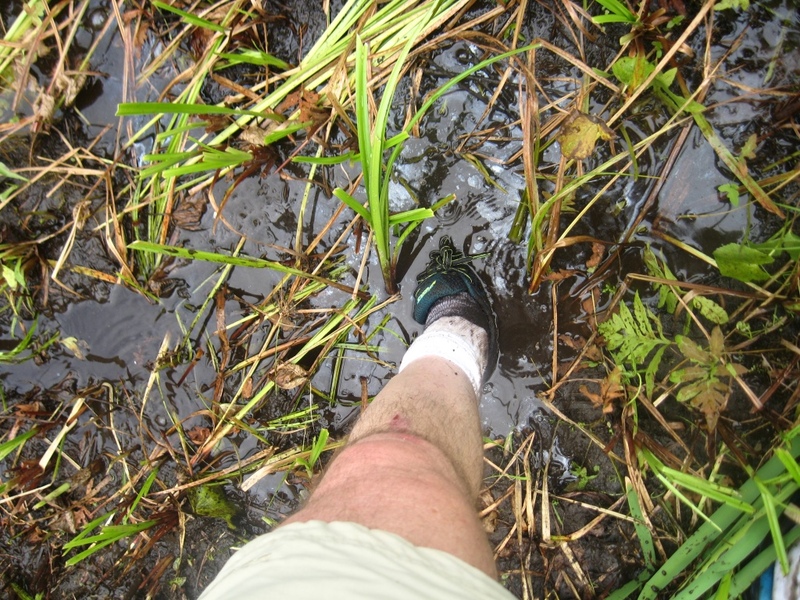 After a short while we came to a normally boggy section alongside a beaver pond meadow. 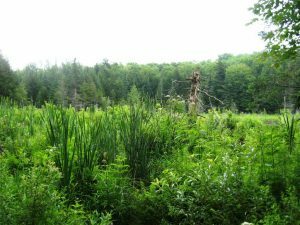 Given the generally dry summer, there were few of the usual quagmires that I was used to seeing in this section, but in one standing pool of water, I did notice something which I found disappointing; Running in the Moosalamoo Wilderness, you really get the feeling that you are far from civilization. This fantasy was disrupted by the inevitable sheen of gasoline on the surface of a standing puddle of water. 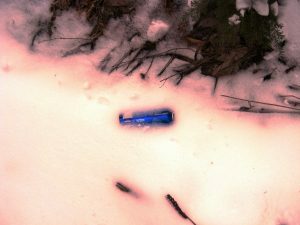 Was it from a passing snowmobile? A chain saw? An ATV? 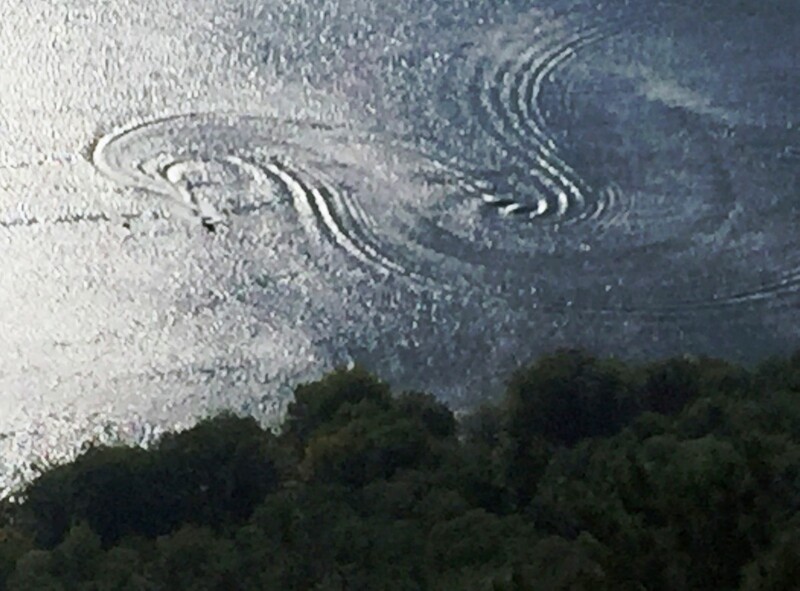 Who knows, but if you stop and think about it, this man-made sheen is a far-too-commonly seen occurrence. Descending further, we came to a well built bridge, clearly suitable for snowmobile traffic, and after stopping to enjoy the brook, we continued up a short, but very steep hill, on a trail which if taken directly would bring us up to the Goshen trailhead above Silver Lake. But I knew that the Big Moose had other plans for us, and when we got to the next trail junction, instead of continuing uphill, we veered to the right down to the small Sucker Brook Reservoir, which at this point in a dry year, was nothing more than a muddy marsh with a small stream meandering through it. But we did hear an unseen loon calling out as we approached it! Going across the berm which forms the shoreline in the spring, we took the trail cutting back onto the downhill side, and into the Penstock part of the course. The Penstock is a wide pipeline, through which water from the Sucker Brook Reservoir can be diverted to Silver Lake, and in turn to the power generation station near the shores of Lake Dunmore. Some more details on this hydroelectric project can be found in a blog posting of mine a few years ago, entitled “Penstocks to Power”. Right below the Sucker Brook Reservoir is one of my less favored places to run – The grass is high and slippery, it is on a sidehill, and the poor footing is hard to see. That said, the rough spot is only about a half mile long, before it opens up to a level, wide, overgrown service trail which got us to the shores of Silver Lake, about 5 miles into the run. It was a cool overcast day at Silver Lake, and the deer flies were pretty incessant, so instead of the usual dip in the lake, we backtracked to meet up with some of the slower runners, before returning to the side of the lake, from which we began our return by heading up the forest service road heading towards the Goshen trailhead. Nearing the top of this section, instead of staying on the road to eventually return the the Blueberry Hill Inn, we took a little used ski trail veering off to the left, and descending. 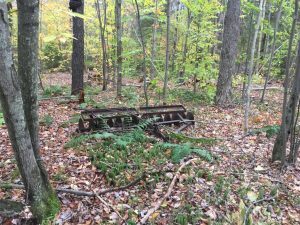 Many years ago, this was a maintained ski trail to connect the Blueberry Hill ski trails with the now defunct Churchill House Inn and ski touring area. Now, it seems to only get foot traffic from trail runners! Bottoming out, we began the gradual ascent back to the Goshen- Ripton road. 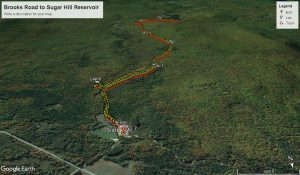 The original route through this section followed existing trails and forest service roads, but some homeowner privacy issues forced a re-routing through a short section of forest, marked by orange streamers. We only lost the trail once, momentarily! I suspect with a few years usage, this section will get worn into a more obvious trail, but for now, it is about weaving through the forest and following the streamers. 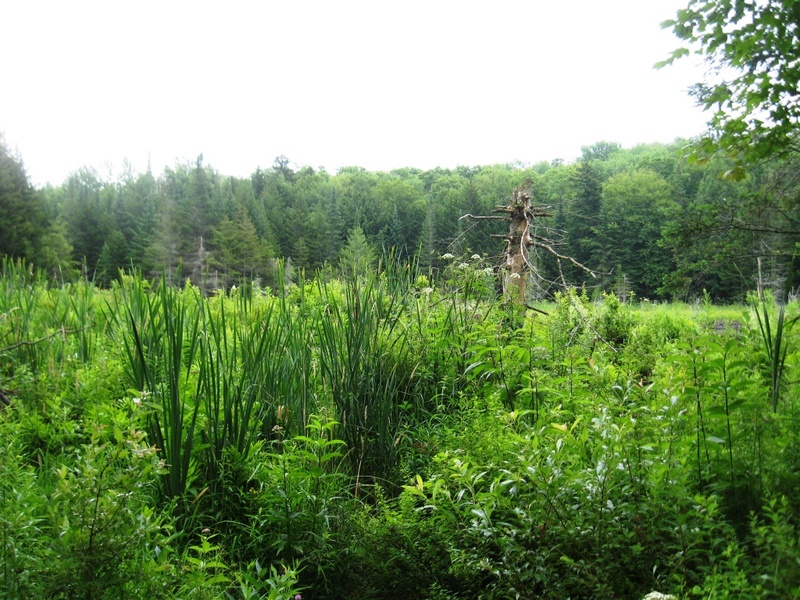 As we approached the road, we came to the dreaded bog, which always seem to find its way into Moosalamoo runs. 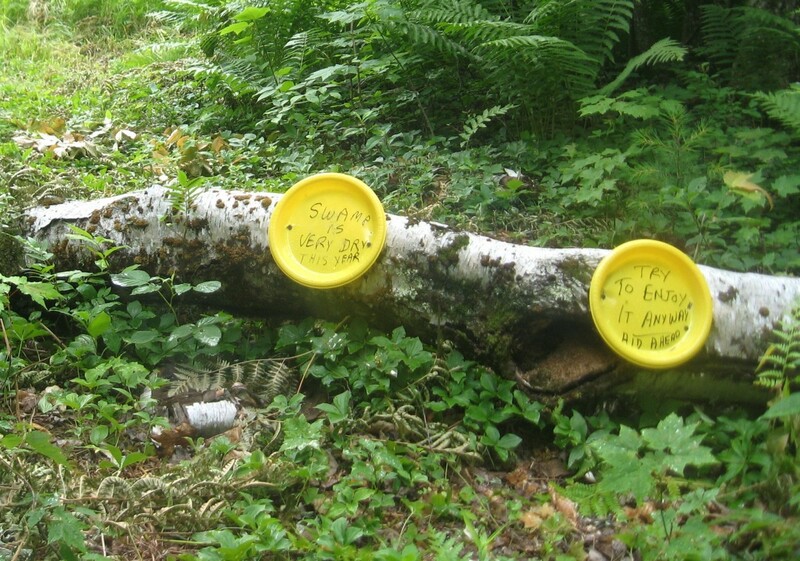 Most of the time, it has mud up to your knees, but when we saw the humorous signs left by the race organizer, we knew it would be a little different this year. Sure enough, while there was plenty enough mud to make my shoes look pretty gross, it was far below usual midsummer standards! Also, note the omnipresent gasoline sheen. Reaching the road, I returned to the Blueberry Hill Inn, to complete a 10 mile run. This run would actually have been closer to 9 miles, but some of us put in a little extra mileage backtracking to avoid deerflies while the group accordianed back together at Silver Lake. There are no monster hill climbs in this section, making it one of the easier segments of the Big Moose, but there were plenty of rolling climbs and descents. Good luck to everyone at the big race in August! 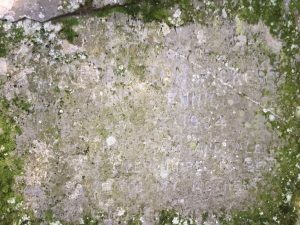 Some of my favorite posts to this blog are when I get a chance to describe a trail that I have never before experienced, and discover something that I find interesting along the way. Then, there are the old favorites – the runs that I come back to, usually for some combination of appropriate challenge and natural beauty. This posting falls into the latter category. If you chat with local avid trail runners, the loop I am describing today almost invariably ends up being mentioned on people’s favorite trails. I have described this run in the past, but since my blog is not well indexed, I thought I would write up a fresh posting, so that newer readers learn of it. 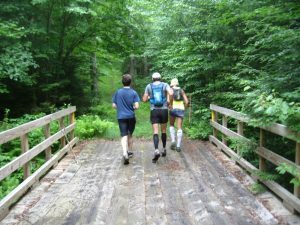 This run is a favorite, largely because it incorporates many of the characteristics of what a lot of us are looking for in a trail run. It has climbs, descents, scenic vistas, and thick forest. Once in a while, you see a bear on this loop (that has happened twice for me, but not this time, alas) and the trails used are either broad double track, or single track with good footing, so that you rarely have to walk due to the trail conditions, although there is no dishonor if you need to do so for a break! On a cool, slightly overcast Sunday morning, a large group of local trail runners got together – some, like me, knew the trail well, and others were “Chandler Ridge virgins” looking forward to seeing this well-loved trail. Due to the coolness of the morning, the mosquitoes weren’t bothering me at all, but a few of my running partners seemed to be doing a modest amount of swatting. The key lesson here – is always run with a friend who the bugs like more than you! We started the run with the well traveled forest service road climbing steeply up to Silver Lake. It was still pretty early in the morning, so we saw few walkers, although we did see a sign indicating that this part of the trail was being used for the now-legendary “Infinitus” event happening up at Blueberry Hill, and the surrounding trails. 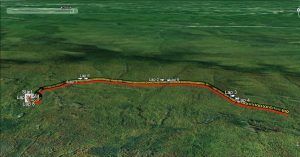 The centerpiece of Infinitus is an 10-day, 888 Km run, that only a handful of runners have actually completed. I was hoping to cross paths with some of these runners, just to see how much of a mess they were at this point, but none happened to be on this section of trail as we were ascending (or later on, descending). Andy, the race director’s quirky sense of humor was on display with his race signs, written both “rightside up” and “upside down” – perhaps for the amusement and/or confusion of the more delirious runners. Once our group coalesced on the shores of Silver Lake, we took the right turn over the dam and posed for a group photo, admiring the little hillock in the distance which would be the altitude high point for the day. 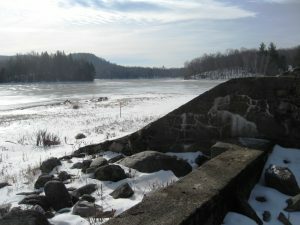 The dam on Silver Lake is part of the small hydroelectric project, in which the originally naturally occurring lake was enhanced by the dam to store water for the power plant down on the Lake Dunmore road. After crossing the dam, we headed left, on true single track along the east shore of Silver Lake, and after about a half mile, we came to a trail junction, with the right turn switchbacking for a few minutes up to the Chandler Ridge, and the left junction to the trail hugging the shore around the lake. We chose the right trail, and a word for the wise – the left fork in the road, staying close to the lake is very poor for running, although it does make for a pretty and interesting hike. After our crew snaked up the west slopes of the Chandler Ridge, we found ourselves up on top, on a trail which sometimes hugged the west (left to us), Silver Lake side of the narrow ridge, and sometimes hugged the east (right to us) Lake Dunmore side, with frequent views through the trees. The trail up here is in great shape, due to the work done in the aftermath of the 2008 deluge which made a mess out of several of the trails in the area. After about a mile on this ridge, we came to a clearing (which was created during the aforementioned trail maintenance) looking back towards Silver Lake, above its southern terminus, also at the high altitude point of the run. As I stopped for a picture, a few of my more keen-eyed running friends spied a bald eagle in the distance. Squinting as hard as I could, I tried to make it out, but couldn’t seem to focus on it. While bald eagles have made a comeback in Vermont, as in most of the rest of the US, I still have never seen one in Vermont, and I am afraid that my streak continues. At this point, we had a few more miles on the Chandler Ridge, staying high on the ridge until the very end, where after a short descent, we connected with the Minnie Baker trail, where we took a right turn, and then a left shortly afterwards. At the second turn to the left, a right turn will bring you down to the Lake Dunmore Road, rt 53, and sometimes early in the season when I know that the shady trail in Leicester Hollow will be covered in snow and ice, I elect to return to my car this way, on the road – but not today! Soon, we had turned around, and were heading north, on the ridge above the stream below. 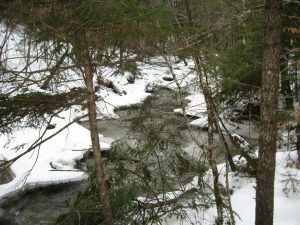 Prior to the 2008 storm, there was an old stage road, built to provide access to the old Silver Lake Hotel, down alongside the banks of this stream, but it was badly washed out in the storm, necessitating the newer trail which we were running on. The gradually climbing trail hugs this ridge for about a mile or so, before descending to the stream, crossing a modern footbridge, and mostly following the old stage road for most of the rest of the ascent back up to Silver Lake. The scenery here is very lush, so much so that I heard one of my running partners refer to it as “Fern Gully”, an apt description. Eventually, the west shore of Silver Lake appeared on our left, and after passing by signs for some of the primitive campsites, as well as a modern outhouse (who knows – this fun fact might be important to you someday, although I discovered once, the hard way, that it is locked shut in the winter) we took the left turn to the lakeshore picnic area and the small beach. On hot days, this is a great place to take a dip in the cold lake water, but most of the party decided that the air was still too chilly to be enthusiastic about a swim today, so after pausing to enjoy the scenery for a few minutes, we began the fast descent to our cars. About a half mile down the hill from Silver Lake, we passed the trail to the left, leading to what is called “Lenny’s Lookout” (as signed). I have often wondered who Lenny is, and while doing some research for this posting, I found out! The Lenny in question is Lennie Waltrip, the long-time summer campground host on the shores of Silver Lake. I have stopped to chat with him on several occasions, but prior to this discovery, had no idea what his name is. This summer, there was a much younger looking man serving as campground when we passed through, so I hope old Lennie, who would be in his late 80’s, is OK! 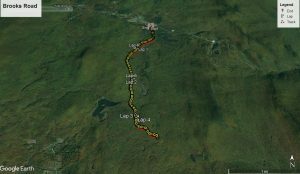 Returning to our vehicles, this ended up being a slightly less than 12 mile run, with a lot of climbing and descending, although most of it gentle except for the first and last mile and a half ascending to and descending from Silver Lake. Thanks to my running friends for joining me on this! A previously written (2011) posting on the same route, with a few different insights. So, while off on a run today, a pretty routine run, which I hadn’t planned on blogging, a very minor punchline became apparent, so I thought I would do a short write-up on it. I only have one photograph in this posting, as I wasn’t really looking to write it up, until something curious happened….. I went into today’s run with one thing in mind. It was a cool, pleasant Sunday afternoon, a week before the Vermont City Marathon, and I wanted to get outside, push myself over a modest distance, and enjoy the pleasures of mother nature. As I mentioned in my last post, I like to benchmark myself on early season runs, to check into my training, and to establish times to beat as the summer and fall progress. The run on Brooks Road (the right turn on a dirt road about a half mile past Breadloaf, before the final ascent to the Snow Bowl), from the Chatfield/Widow’s Clearing parking lot has long been one of my favorites for this purpose. 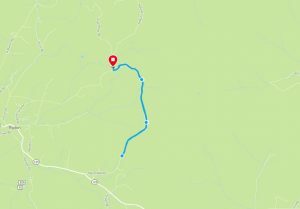 It is a forest service road, with easy footing, and climbs in a series of short, moderately steep ascents, with long flat sections in between, leading to a 3.5 mile, slightly less than 700 ft vertical ascent. Setting off from the bottom, the run is flat for about a quarter mile, then starts climbing, shortly thereafter. As I reached the end of the first mile, I suddenly saw two dogs bounding towards me off leash. Hearing their owner behind them shouting “Don’t worry – they don’t bite….” I reminisced over incidents when the next dog move was to lunge at me. Fortunately, these two where indeed only interested in having a good sniff of sweaty runner. But that isn’t really the shaggy dog story. What I did notice, was that I was running very well, so I began to wonder if I could match or improve upon my PR for the ascent. Sure enough, as I reached the end of the dirt road, I looked down at my watch, and noticed that indeed had ascended faster than ever before. I don’t make a habit of posting times and speeds in this blog – because frankly I am not that fast, and I don’t want this to turn into just another training blog. That said, I also knew from past experience that I had never done this run, as a round trip, in less than an hour, and realized that with the downhill acceleration, I just might be able to accomplish this, so I turned, and headed back down the hill. Are you bored yet? Still waiting for the punchline? 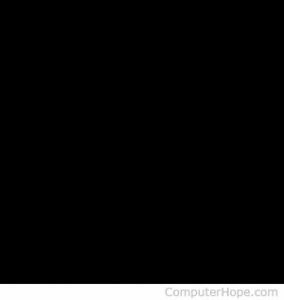 Feel free to click on the photo – if you expand it to full size, you will see that it is indeed a black, 4-legged creature. This year’s never-ending winter seems to have loosened its grip – there are only a few stray patches of snow at the higher elevations, and my legs seem to be recovering from my first 26.2 in a year and a half, undertaken a week and a half ago. 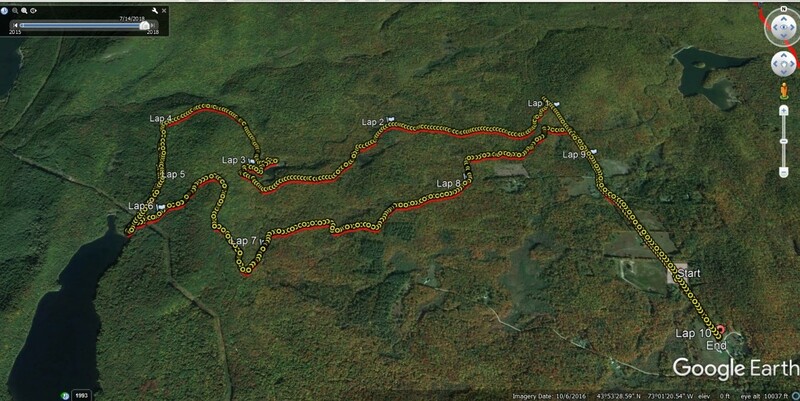 A lot of my friends ran in the Middlebury Maple Run this Sunday, but my legs didn’t feel recovered enough yet for a decent half marathon, so I decided to head out to one of my favorite runs – the ascent from the Falls of Lana trailhead, past Silver Lake, to the Goshen trailhead and returning. I know I have done this run countless times, and blogged it quite a few times as well. But, I almost always do this run as one of my first trail runs of the warm season. The long mornings in the treadmill in the depths of winter and a few months of all my outdoor running being on the roads is finally giving way to the best part of the running year. 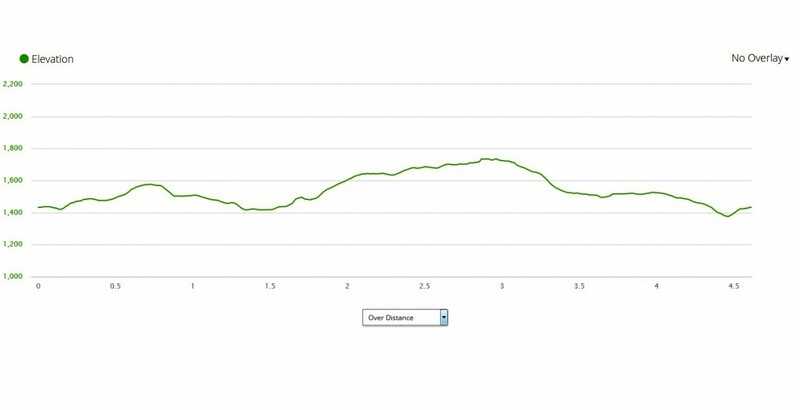 This particular run is a great way to test out my legs on a trail which isn’t as muddy as most of the single track trails in May, and I get to see how things feel when I start to mix some more serious hills into my running. Finally, it is fun to see how my times improve as the summer progresses, so this first trail run of the season will serve as a benchmark for later runs! 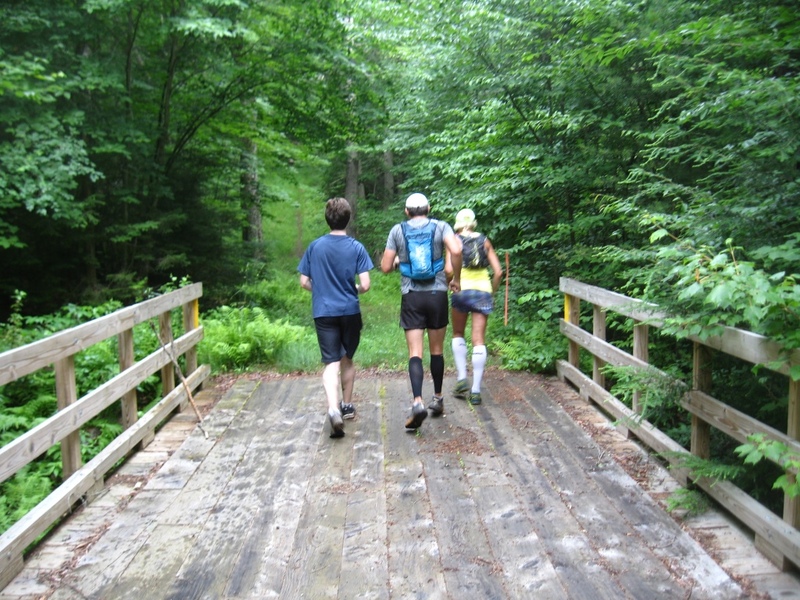 A few recent articles in Runners World have put Middlebury on the map as a great runners’ town, and for road runners, this is probably due to the popularity of the Maple Run, while the TAM gets a lot of good press for trail runners. As relative newcomers start to look for more adventurous terrain than the TAM has to offer, the Moosalamoo region, which this run is part of, offers a fun step up. 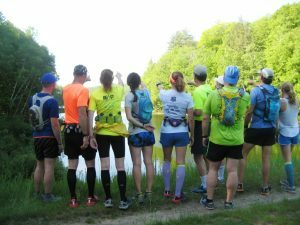 There are trail races ranging from the challenging, but accessible (The Goshen Gallop, 6.6 miles) to the longer challenges (The Moosalamoo Ultra 14 or 36 miles) to the downright ridiculous (Infinitus – up to 888 miles over 8 days!) The run I am blogging today provides a nice introduction to trail runners interested in a little wilder than the TAM offerings! When I started enjoying this run, 10-15 years ago, I never saw another trail runner on while I was runnin, but now, it is rare that I don’t cross paths with other runners enjoying it. 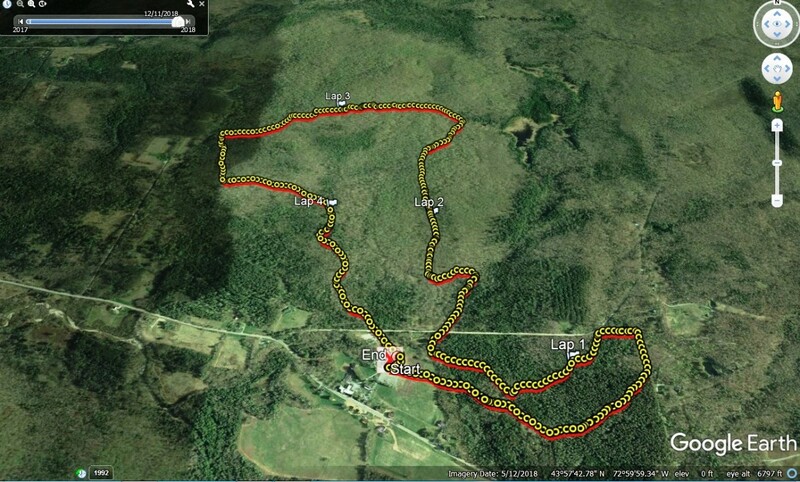 The run starts at the Falls of Lana parking lot, the large lot on the right, just south of Branbury State Park. I just learned the origins of the name “Branbury” by the way. It is not the name of some famous settler, politician or benefactor – it is simply an amalgamation of Brandon and Salisbury – the two nearest towns. How creative……. I usually skip the short connector trail that heads diagonally up from the parking lot, instead heading north on the road towards Branbury for just a few yards, taking a right onto the gated forest service road which climbs steeply from the start, before leveling off and crossing under the penstock. 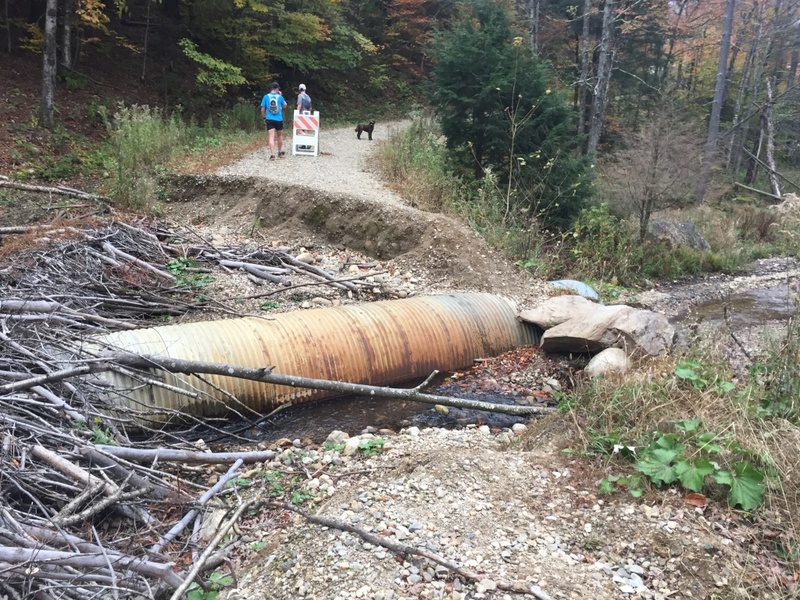 What the heck is a penstock? I just happen to have the answer in a previous post. After a series of hairpin turns, the trail climbs relentlessly towards Silver Lake. I was concerned about how passable I would find the trail, as it is still early spring, and we had a few very windy days where a lot of trees got knocked down. Fortunately, the trail crews had already made short work of the many down trees, with the only sign being their trailside debris. Continuing up, I reached the shores of Silver Lake after a mile and a half. For most casual hikers, this is the point of the trip up from Lake Dunmore, but looking for higher mileage, and more climbing, I stayed on the trail, which after another short, steep climb, veered to the right to reach the high point, a few hundred feet above Silver Lake, at the Goshen parking lot. This lot has a bit of a bad reputation for car break-ins, so I rarely use it. I was comforted, however, to see a Forest Service vehicle parked there, perhaps providing a little deterrent to window-smashing wannabees. At the far side of the parking lot, the obvious trail down begins, and after about a quarter mile, the right turn at the trail junction begins the descent to Silver Lake, in earnest. Running down this one section of true single track trail, I heard some scampering sounds in the woods, and reminded myself of the usual adage – “If you can hear it, it is just a squirrel”. 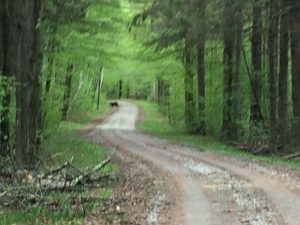 However, at one point, I turned around and saw my first bear of the season bolting up the hill, a few yards behind me, and getting away from me as quickly as it could. My guess was that it was running away from whatever I was running away from. That said, it is always a rush to see these magnificent animals, and I stopped to watch it amble away, made all the easier by the lack of foliage at this altitude, this early in the season. Someday I will get a decent picture of one of my bear incidents! 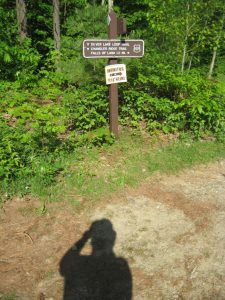 As the bear disappeared into the forest, I resumed my run down the hill, reaching the Leicester Hollow trail, where I turned right, passing by a few groups of hikers, letting them know of what they had just missed. When the sign for the Silver Lake picnic area appeared on the left, I took it, coming to the bridge over the sluiceway bringing water down to Silver Lake from the Sucker Brook Reservoir, a mile or so away at higher altitude. Sometimes, this sluiceway is dry, as Green Mountain Power tries to collect the water in the higher reservoir to save it for high electricity demand in the summer months, I presume. The rush of the water told me that they had to let some out – I bet the reservoir is pretty full at the moment due to the sudden snow melt! I hope to run up there soon to see. From here, I ran along the shore of Silver Lake – a great place to take a dip during summer runs, and returned to the forest service road, for the high speed plunge back to my car. The footing was usually good enough to just let my legs cut loose, but some glute tightness the next day reminded me that this was the first serious downhill run of the season. Returning to my car, this ended up being about a 5.5 mile run, with about 900 feet of climbing and descent. Challenging, but not overly so, by Vermont standards at least. If you haven’t run up here – give it a try. It can also be a great place to put in a good workout in the heat of the summer – it is typically 5-10 degrees cooler there, between the shade and the swimming spots. Finally, this is the beginning of the 10th year of this blog. I have some really fun “bucket list” runs in the planning, which I hope some of my friends can join me on. Hoping we all have a great summer! Given the recent loss of snowpack, my plans to do some cross country skiing turned into a running day. I wanted to find a run where there was enough snow to feel wintry, but didn’t want to find myself scrambling, rather than running, on icy single track. So, I thought that the run up to the Sugar Hill Reservoir, using groomed snowmobile trails, would make for a fun run, especially since I would be wearing my slip-on Microspikes. 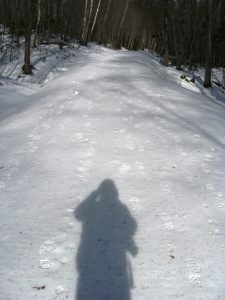 I had detailed this run many years ago, in my first year of blogging, albeit in the summer, so I thought it would be fun to rehash the run, with some winter photos. 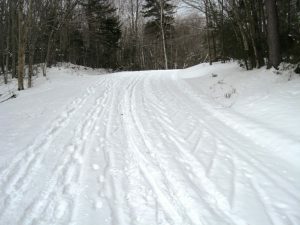 Arriving in the parking lot, found at the end of the plowed portion of the Brooks Road (the road on your right, just past Breadloaf heading towards the Snow Bowl), I saw a few other cars parked there, showing that the warmer than usual weather had inspired others to get outside! Parking my blue beetle, I started the run up Brooks Rd, where It had been recently groomed for snowmobile travelers by our friends at the Vermont Association of Snow Travelers, aka VAST. 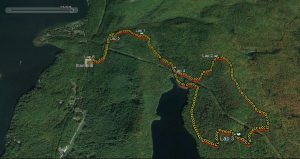 As an aside, VAST makes a detailed map of all the snowmobile trails in the state, which is an excellent source of trail running inspiration in the winter or summer. I purchased a copy of this map at Rosie’s Restaurant in Middlebury, although I assume it is available in other places. As I have noted in the past, the combination of groomed snowmobile trails and microspikes makes for excellent winter running. I never felt like I was going to slip, ascending or descending, and the spikes didn’t seem to appreciably slow me down. If was also fun seeing the mix of tracks – deer tracks, bird tracks, dog tracks, people tracks, and some skid marks that looked remarkably like sled tracks on the hard packed snow. The run starts off easy enough, pretty flat for the first quarter mile, but the next mile after that is where the bulk of the climb takes place, ascending relentlessly up 400 vertical feet. I also have noted various side trails along the way, and once in a while make a mental note to explore them. A half mile up the hill, I noted an unmarked trail to the left, and decided to explore it during my descent. 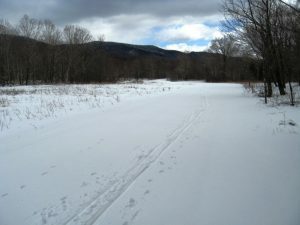 At about the 2.5 mile mark, the snowmobile trail makes a well marked right turn, with a short ascent, and a steep descent down to the Sugar Hill Reservoir – the body of water that is the highest altitude part of the water project funneling water down to the small hydroelectric plant on the shores of Lake Dunmore. Reaching the shores of the reservoir at a little over 3 miles, I looked completely frozen over, and I briefly considered running on the ice, around the periphery, but common sense prevailed, and I realized that this little adventure needed to wait until I wasn’t running alone. On a typical summer day, there are usually a few fishermen or kayakers playing in or by the water, made easily accessible via a dirt road from the Ripton-Goshen road, but today, I was the only person there enjoying the scenery. The lake looked cold and windswept, but it was such a warm day, that just hanging out for a short while on the shores was rather pleasant. This was a straightforward run, so my return simply involved retracing my steps, with the addition of a little bit of exploration on the side trail, near the bottom, on my right while descending. It looked like a well- beaten trail, so I figured it had to lead somewhere, right? Well, it went all of a tenth of a mile, ending at a small stream, leading me to the conclusion that this trail served the needs of fishermen, not runners and hikers. It was a pretty little place, however. 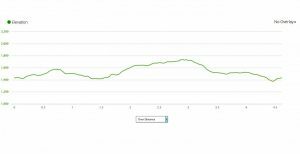 Returning to the Brooks Road, I completed the descent for a 6.5 mile run, with about 600 total feet of climb and descent – a very modest run for a laid back weekend day.